Updated We've revised our Galaxy Note 9 review now that other big-screened smartphones have come out. Here's our updated take. Xiaomi is continuing its mission to expand outside China – but how does the Xiaomi Mi 9 stand up to competition? Updated As manufacturers abandon the notch, the Google Pixel 3 XL stands out for its prominent screen cutout – which is a small price to pay for its superior camera. The Oppo Reno is priced as a mid-ranged phone but offers features that are closer to a high-end phones. Huawei’s P30 Lite sheds a lot of what makes its higher-end siblings stand out but manages to deliver a high-end design and a versatile camera setup on a budget. The Huawei P30 is an impressive phone for photography and more, but it doesn't hit all the flagship marks. We give our official verdict on the phenomenon that is Fortnite. Stuck in the middle with a whole lot of Galaxy A series, the A40 may get lost in crowd. With a big battery, huge screen, good cameras and enough power, the Galaxy A70 is a promising mid-range smartphone. 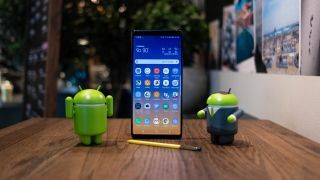 The Galaxy A80's pop-up, rotating camera is a fun party piece, but there's more going for this phone than just that.